In this installment, we get the balance issues sorted out, and then fix the placement of the back yoke and address the sleeves some more. Before we get started on the fittings, I wanted to address the issue of the fitting lines on the muslins. How does one determine where to draw the HBL? I understand how this information is crucial and I even have purchased the Veblen book however it is very frustrating that there is no description for how one determines where to draw these lines. This is a good question, and one I also had when I started working with Sarah Veblen’s fitting methodology. So here’s my attempt to elaborate on the direction provided in her book. Most of my comments are informed by my experience with male bodies, but I also received some insight from my draping class that might help. The balance lines are not just a tool to tell you not only that the garment is hanging off-grain. They can also help you identify where in the garment the problem lies. 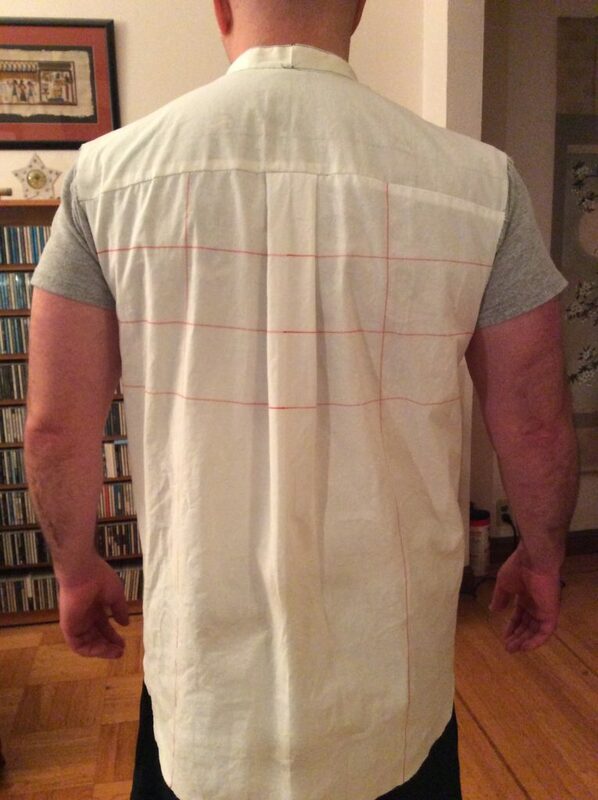 For instance, let’s say you place two horizontal lines on your muslin – one above the chest, and one at waist level. If the horizontal line at chest level is level, but the one at waist level is tilted, that means you have to make an adjustment somewhere between chest and waist to get the waistline to come to balance. That might mean adding or removing fabric at or below the chestline. To fully resolve the issue, I needed to make not one but two balance corrections, one in front and one in back. Sarah Veblen generally recommends placing a horizontal balance line at natural waist level. I prefer more than that. One at the underarm point. Another a few inches up, just above the chest area. Another a few inches down, at or near the natural waistline. This lets me see if the balance issue falls above, below, or in between or any of these points. One at the natural waistline. Another directly through the bust point on the pattern. I think a line through the bust point is particularly important. 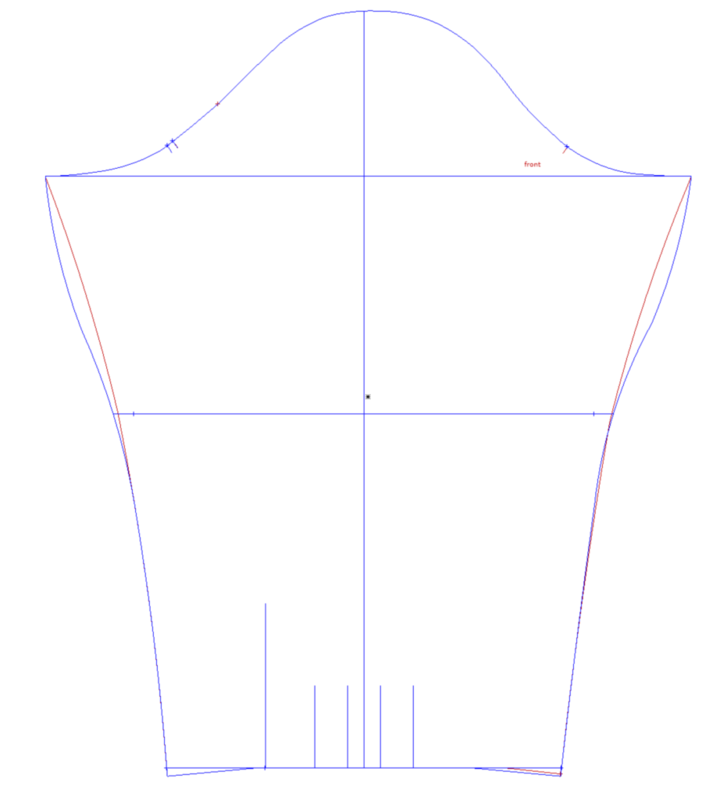 You want to know if the pattern’s bust point lines up with the actual bust apex on the body, and not lower or higher. If not, all of the shaping devices around the bust area (darts, gathers, princess seams etc) will be misplaced – they’ll be shaping for a differently placed bust. That will cause all manner of fitting issues. That said, I would only use this line to evaluate placement of the bust point. 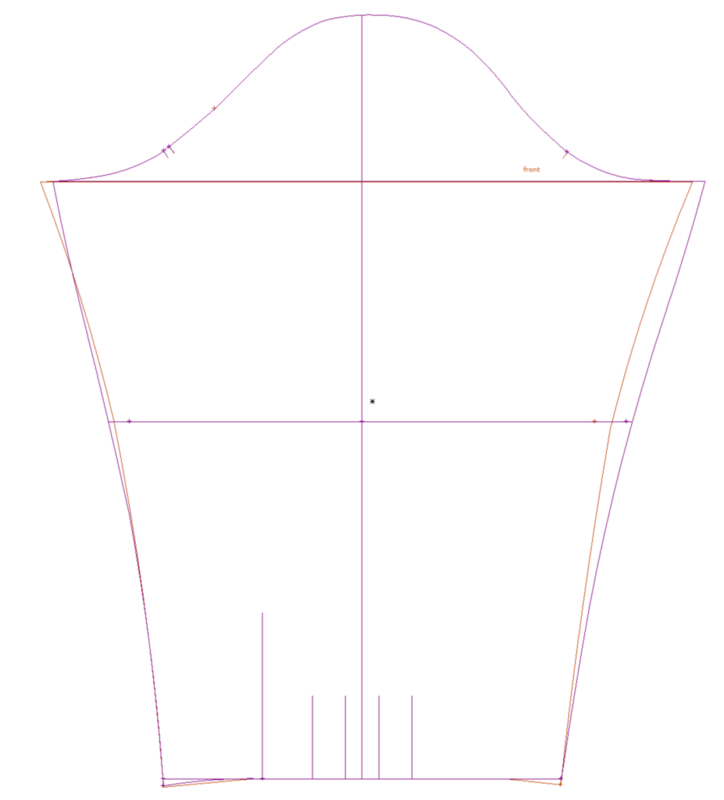 Unless you are fitting a bodice sloper, the pattern design may intentionally run the crossgrain at the bust off horizontal to achieve some sort of style effect around the bust area. Finally, I would probably put a balance line at the high bust line (just above the bust) to complete the horizontal balance lines. A single horizontal balance line, at the underarm point (the bicep line). One at the crotch point. Another at the hipline (widest part of the hip). That is a few inches above the crotch point. Another a few inches below the crotch point. Perhaps a final line 2-3 inches above the hip point. Again, this allows you to see at what point the crotch curve needs adjusting (lengthening, taking it in/out) in order to get the lines in that region to come to balance horizontally. Sarah Veblen doesn’t stress the vertical lines that run along grain as much as the horizontal lines, but I think they are equally important. You can look at a garment and see if the vertical lines run straight up and down. Or do they bow inwards toward or outwards from center front/back? As an example, if the vertical lines bow inwards towards center front, that might mean you need to add some ease at center front, or remove ease from the side seams, at the area where the bowing happens. Center Front and Center Back. One vertical line on each side piece, starting on the shoulder seam about an inch or two from the high shoulder point (where shoulder shoulder meets neckline) and running parallel with the grain to the bottom hem. Same set of lines on the back. Very similar to men, but I would make sure the vertical lines running down the front go through the bust point on the pattern. 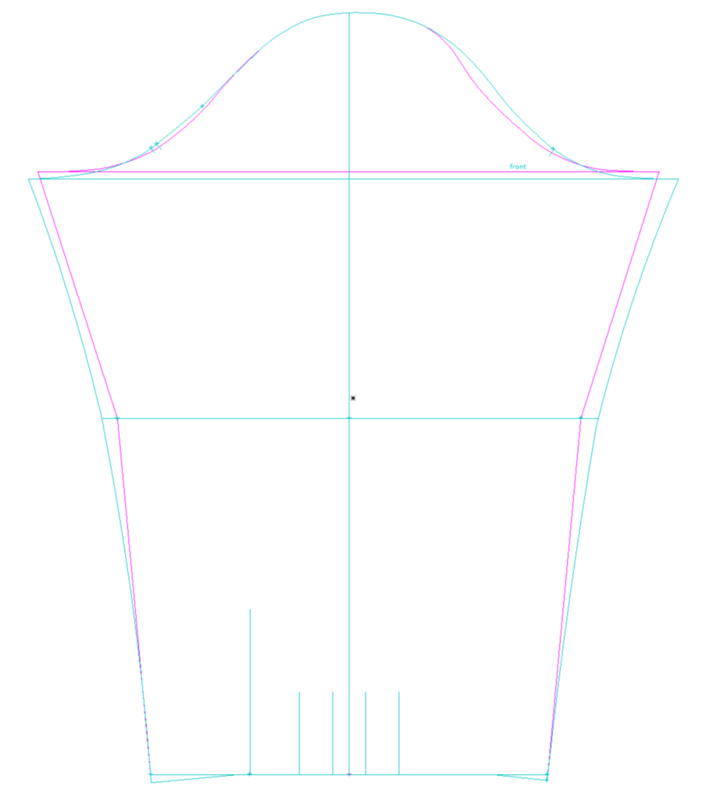 Again, this is to see if the bust point on the pattern lines up horizontally with the bust point on the body. A single vertical line, running from the top of the sleeve cap down to the cuff. 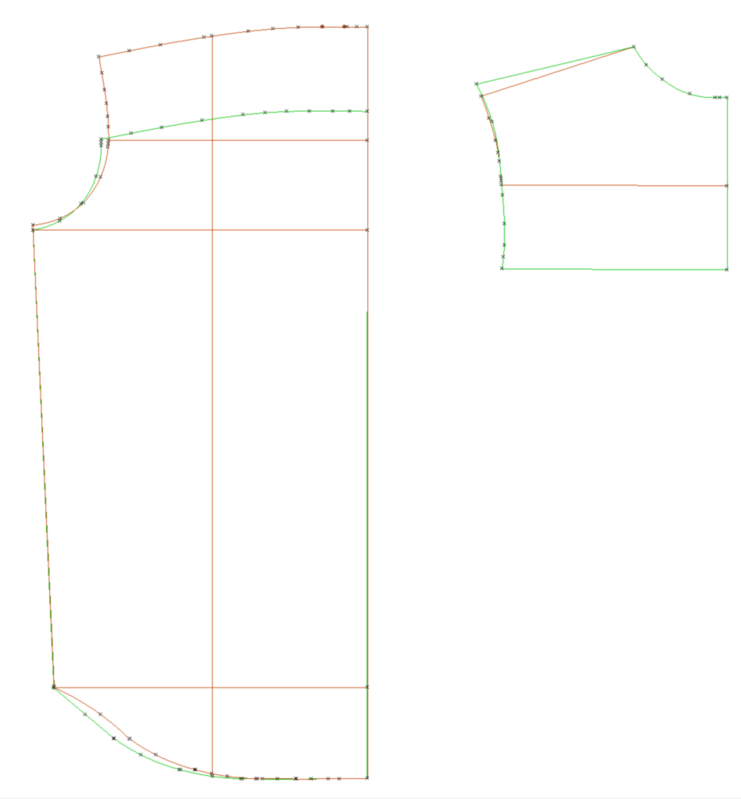 For pants, I would run vertical lines on both front and back pieces, going through the center line of each piece. This is where you would press creases in the finished garment. 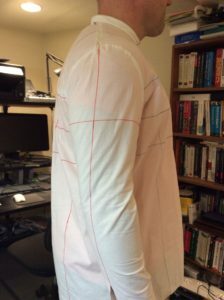 On a properly drafted pants pattern, the way to do this is to start at the cuff, find the midpoint, then draw a line perpendicular to the cuff line and run it all the way up to the waist. I hope that makes my current methodology for placing these fitting lines more clear. The balance in this muslin is finally OK, and hangs nicer on the body. The yoke seam is still too low. The box pleat needs to be located just above the tip of the shoulder blades to work best. On this muslin, I’ve marked a faint line about an inch and a half above the current yoke seam. This places the top of the box pleat flush with the top of the shoulder blades. Here’s something new I noticed: the alteration to move the shoulder seam forward landed it in in the right place generally – but the slant front/back is wrong. It’s fine at high shoulder point, but at low shoulder point it is too far forward. 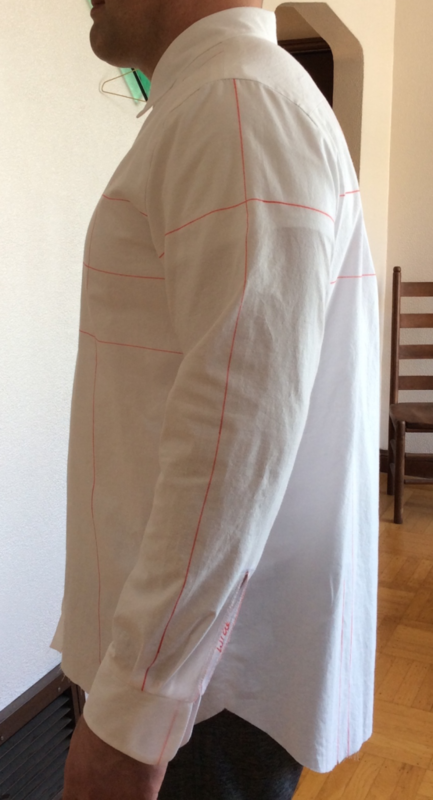 It needs to move 1/2 inch towards the back, to make the shoulder seam line up with the actual shoulder line. The client wants the sleeve to be about a half inch longer. That’s a trivial change to make. The ease is not distributed well between front and back on the sleeve. There is not enough ease in the back of the sleeve at the biceps area – the back of the biceps bump up against the sleeve, but the sleeve is billowy in the biceps at front. This points to an error to my pattern work to enlarge the sleeve to fit the armhole. Instead of adding more ease at the top of the sleeve cap as I previously did, I need to add ease to the sleeve cap at the underarm area, distributing more towards the back of the sleeve. The sleeve hangs off-grain. The vertical grain line tilts towards the front. The entire sleeve needs to rotate within the socket a bit towards the back to get the sleeve to hang vertically. Again, this will make the sleeve hang cleanly and eliminate some wrinkles. I went in with the magic marker and drew in a vertical line in pink, to get an idea of how much I need to rotate the sleeve backwards, about 1/2 inch in this case. 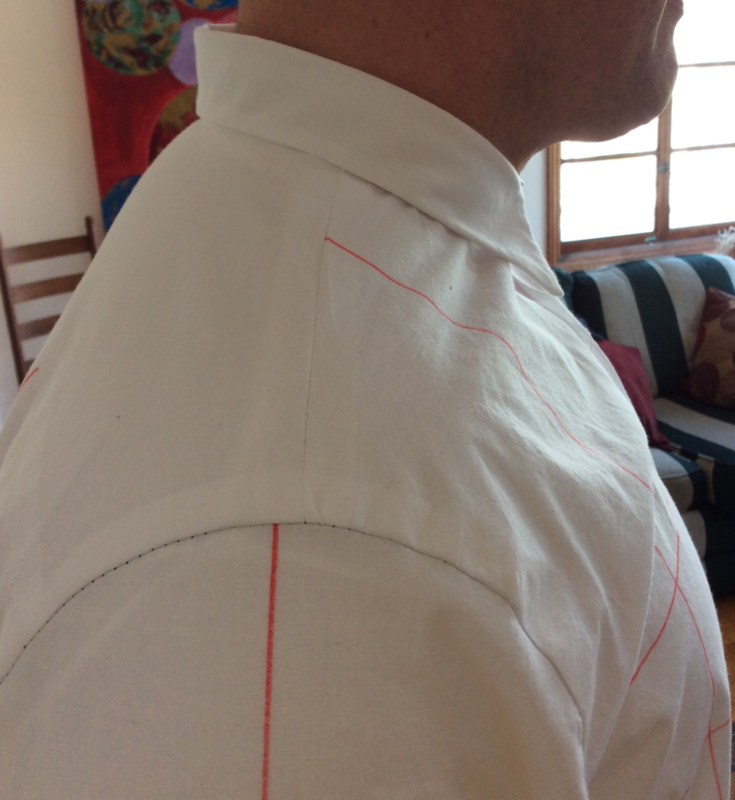 The slit for the cuff placket appears to be in the proper place, which is about in the middle of the arm when viewed from behind. The neckline seems improved, but is still too binding in front. I raised the back yoke seam another 1 3/4″ inch, for 3 1/4 inches total. The pattern work to do this was difficult. It seems like it would be straightforward to simply raise the seam. But because there is a curve at the end of the seam (the armscye curve) and a pleat involved, the relocated seam had different lengths and the yoke and back went out of true. After some deliberation, I opted for a pivot/slide approach. I pivoted out the armhole using the shoulder point as the pivot. This altered the armhole curve in back slightly, making it a bit narrower so yoke and back seams true. But, I may have to go back and redrape the armhole on the client. In the screencap below, Green is Muslin D, Orange is Muslin E.
I moved the shoulder seam backwards by 1/2 inch at the low shoulder point. The seam location at high shoulder point stays where it is. You can see that in the screencap of the pattern work above; the slope of the shoulder is different. On the sleeve, I went back to the version before I added ease at the top of the shoulder cap by slashing and spreading. I finally scanned the paper sleeve pattern into the computer in order to produce the next draft, rather than slashing and taping. Once the sleeve was in digital form in PatternMaster, I added ease at the undearm, rather than at the sleeve cap. A total of an inch of ease needed to be added; there is more added in front in an attempt to rotate the sleeve backwards in the socket Also, I added a bit to front of the sleeve to provide some more ease of movement in front. Purple is Muslin D, Teal is Muslin E. The front curve is to the right. I also wanted to get moving on a style for the shirt collar. The next muslin would have a stand and collar I copied from a Japanese pattern making book. 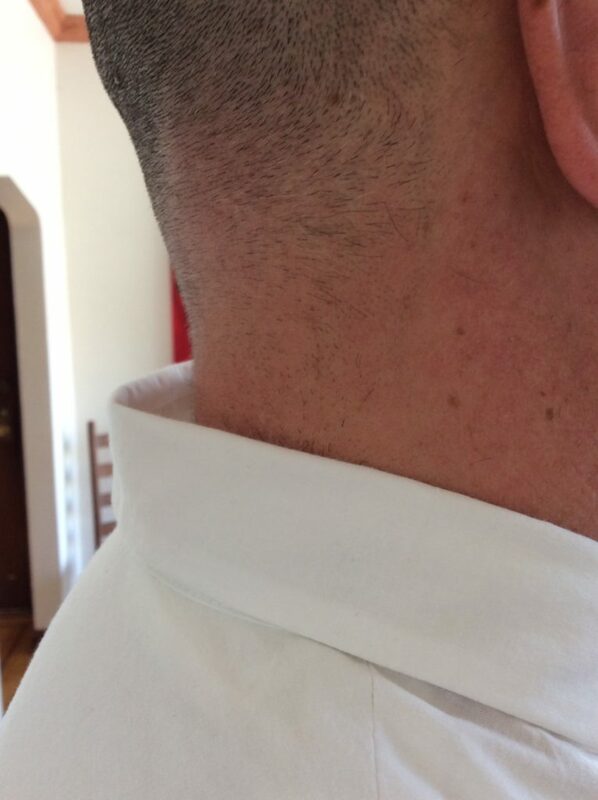 This is a work shirt collar. This muslin marks the point where the main body of the shirt finally gets under control. One exception is the neckline, which has failed to settle into place ever since the balance corrections caused my new neckline to slide backwards. As you’ll see, I’m about to make a mistake with the neckline that causes the fitting to take much longer than it should have. Raising the yoke seam in back has resolved the front/back mobility issues. Yay! 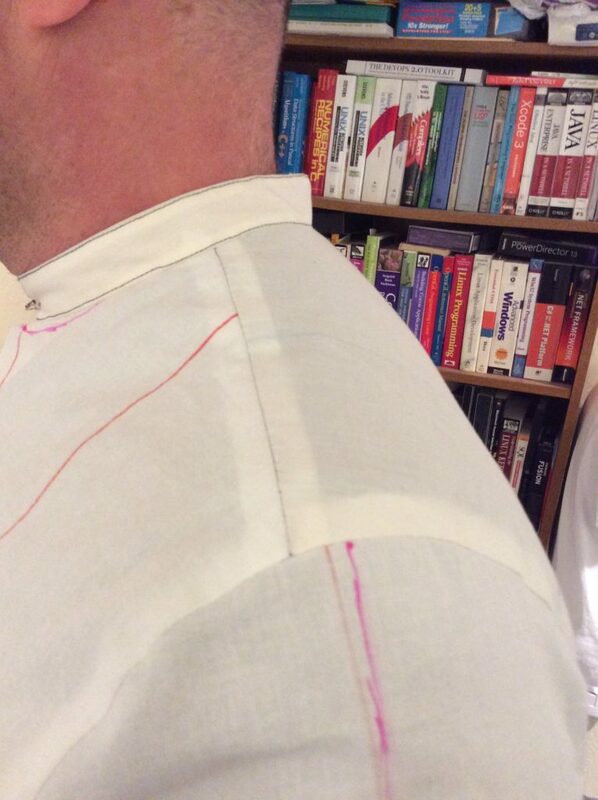 The shoulder seam now finally sits along the client’s shoulder line. Double Yay! The “muscle” sleeve won the bakeoff. 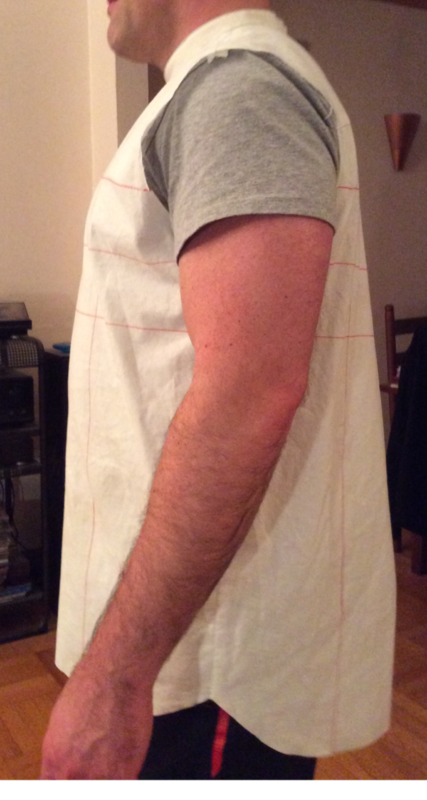 But I added a bit too much fabric in the bicep area and now it looks “poochy”. Mobility when raising arms is still an issue – the side seams of the shirt pull up. The sleeve balance and hang is still off. 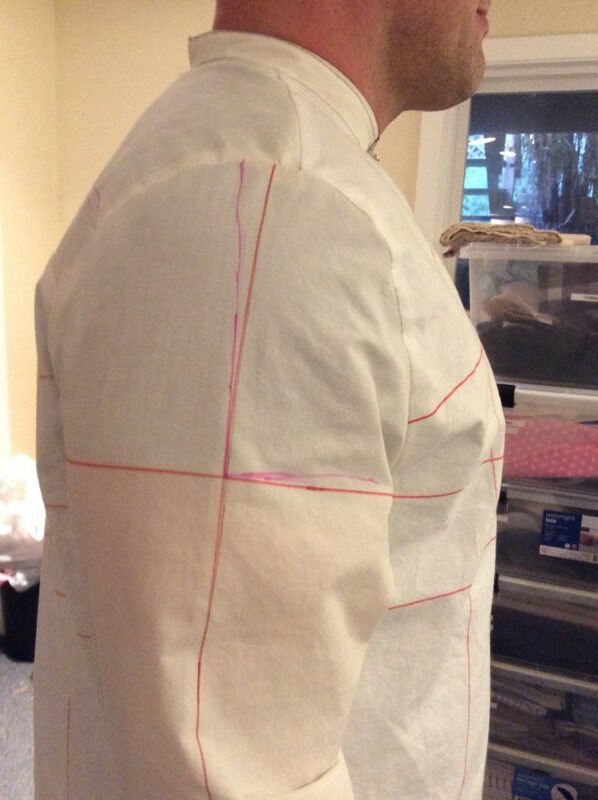 My pattern alterations to the sleeve corrected the ease by transferring fabric from front to back. But, they didn’t rotate the sleeve cap, so the sleeve still hangs forward. (I was nervous about combining too many changes to the pattern at once). You can see that vertical grain line tilt and bow as it goes from the shoulder to the bicep. The collar fits snugly in front, but I have noticed the back of the neckline gapes. Moving the entire neckline forward would resolve the issue. In pattern terms, this means raising the neckline on the back piece, and lowering it on the front. The work shirt collar is a bit too small, style-wise. The collar blades look too small. 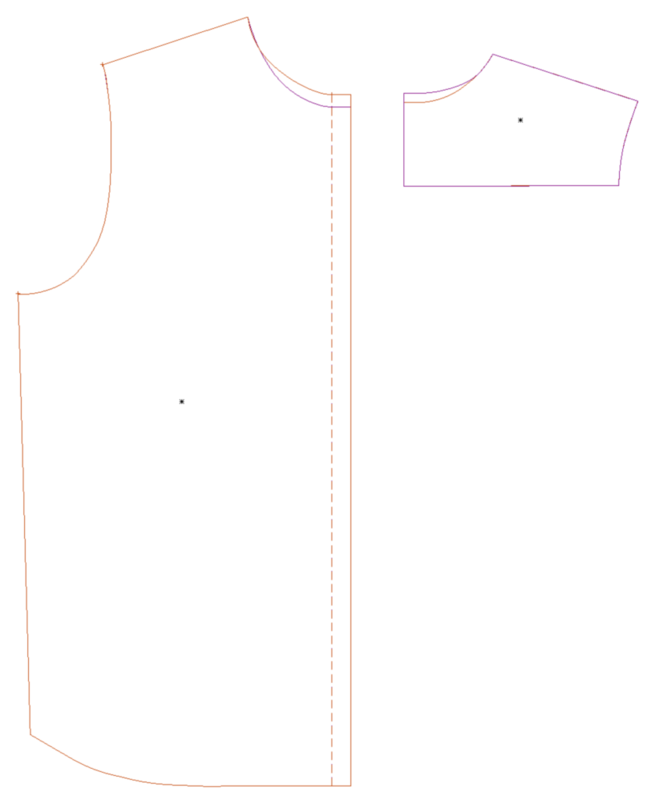 To shift the entire neckline forwards, I raise the neckline 3/8 forwards in back, and 1/4 inch in front. I chose 1/4 inch because I thought I may have added too much to the neckline in front, and didn’t want to make the neckline too loose. This is the mistake I alluded to earlier; I should have used 3/8 for both front and back, simply moving the neckline forwards on the body. You’ll see this play out in Part 3. Orange is Muslin E, Purple is Muslin F.
Rotate the entire sleeve cap towards the back by 3/8 inch. This is done by shaving 3/8 inches off the back seam at the underarm point, and adding it to the front. Orange is Muslin E, Purple is Muslin F. You can see the purple curve is a little shorter in back (left) and a little longer in front (right). With the sleeve on the body, I pinned out the excess poochiness in the muscle sleeve to something that looks good but does not hurt mobility front/back, and transferred the pinned lines into the computer. That alteration also appears in the above screenshot; the extra ease at the bicep area is added at the front along with the sleevecap extension to rotate the sleeve. However, the curve is not as extreme as with the previous “muscle” attempt. 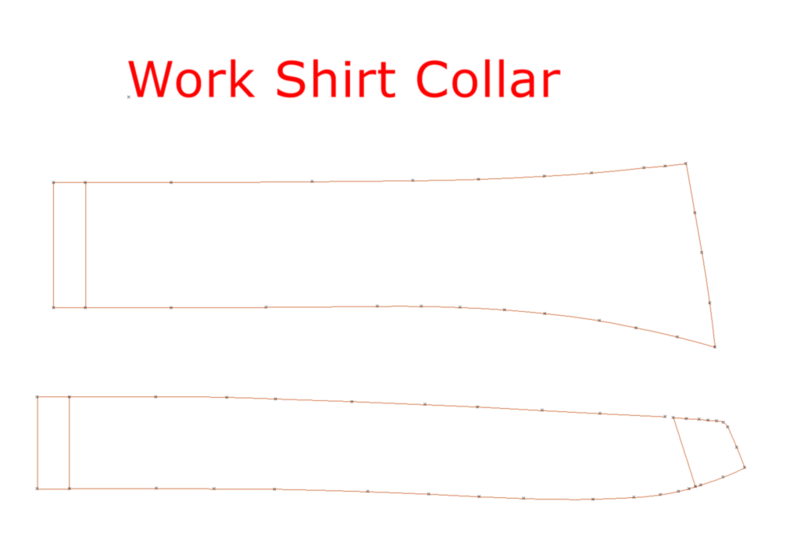 Adopt a new stand and collar, this time traced from a Ben Sherman shirt in my closet. The sleeves and the neckline will finally fall into shape. The minutiae to get it “right” is excruciating, and you’re going the distance. I am really enjoying your process (and learning, too!). Usually I look forward to seeing the end result but with your blog, I look forward to every step.